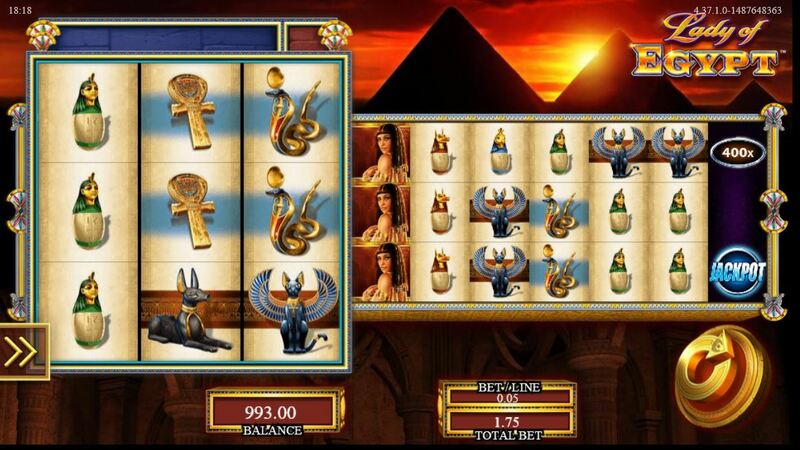 Lady of Egypt slot is like no other slot, despite its overused Egyptian theme, possibly the second most common to the Oriental one seen so often these days. The star of the show is a beautiful lady resembling Cleopatra although thankfully WMS have refrained from naming the game after her. Other symbols are similar to the typical icons of this theme like those you will find on IGT's Cleopatra and Nextgen's Egyptian Rise, including the crook and flail, ankh, statue of Horus and mummies. Back to the unique appearance of Lady of Egypt - let's say I had a surprise like Howard Carter when he first saw into Tutankhamen's tomb and it wasn't from the typical Egyptian haunting and melodic background music! So we come to the obvious unique characteristic of the slot: the highly unusual reel sets. You have a 3-reel and 3-row slot on the left with 9 pay lines and stacked symbols, including the Wild on reel 2. This is called the 'Speed Spins Active Reel Set' To the right there is another secondary reel set with 7 reels and 3 rows of which the last reel (10th) only contains single cash awards and spaces. The awards are 'Jackpot' which is one of three prizes of either 1000, 5000 or 20000x line bet or simple wins of 350, 400, 450, 500 or 1000x line bet. So immediately you can sense the volatility and potential offered by our Queen of Egypt. There are Wilds singly on the second reel set appearing on reels 4, 6 and 8 and Golden Sun scatters on all reels which we will come to later. The game costs 35 coins to play and the pays are highest for Cleopatra at just under 3x stake for 3-of-a-kind down to mixed coloured mummies at 1/7th of a credit. You do however get paid for mixed symbols too and should the 3X3 reels be filled with a single symbol, or Cleopatra along with cat and dog statuettes you are awarded an 'expanded pay' which is about 55x stake for Cleopatra down to 6x for mixed mummies. So yes, you often see the reels stop, think you have no matches but you in fact do. This where the main feature of the slot occurs. After any win on the Speed Spins Active Reels you get paid and these reels move 2 positions to the right so you are now covering reels 3, 4 and 5. When an initial win occurs the secondary reels won't stop until this move to the right has occurred. Should you get a second successive win through this event, it is paid at a 2x multiplier. The 3 reel window then moves 2 further positions to the right, this time with a 3x multiplier so you are covering reels 5, 6 and 7. If this provides a win, the reel window moves right again to cover reels 7, 8 and 9 and this win if occurring pays at 5x multiplier. On each occasion the reels not under the window keep spinning until you either lose or the window moves right to cover them. So having had 4 consecutive wins you've run out of reels - but not quite as you've earned a spin on the tenth prize reel which awards the prizes and jackpots described above. Naturally disappointment will find you most times as the prizes are all substantial, but the Lady is quite volatile so that's only to be expected here! Hit one and you'll be paid a minimum of 350x stake. Three or more Golden Sun scatters anywhere on all the reel sets triggers 8 free games, 4 awards 12, 5 awards 16 and 6 or more 50x stake and 30 free spins. There is no retrigger but there is an enhancement - the Wilds on reels 2, 4, 6 and 8 appear super-stacked. This greatly increases the chance of successive wins for the multipliers and naturally attempts at the 10th reel prizes. Good luck!